Many times we hear of ways and means of making the classroom a print-rich environment. But did you know that you can also provide such an environment in your home? In doing so you automatically involve your children in reading. They begin to make meaningful connections between the printed word and the sounds they hear which ultimately contributes to their success in learning to read. From the refrigerator to the door to the chair, any object in the home can be labelled. Make labels using paper or card stock (even an index card works) and a marker. Or if you prefer you can print the text out and paste onto construction paper. The font size should be clear and large enough to be read from anywhere in the room. Tape labels to objects and at eye level as much as is possible. If you’d rather not put labels all around the house, then chose one room to label (maybe your child’s bedroom or the kitchen). Books and Other Things with words: Have books and other reading materials (such as magazines) in view and in close reach so that they are always available for browsing and/or reading. These books and magazines can be on a shelf or on table or anywhere that your child can see and access them easily. Maybe you have take-out menus hanging around somewhere. Put them out so children can read about foods. Foods and Recipes: Read out loud the recipe that you are using to prepare dinner. Ask your child to find the ingredients that begin with a certain letter. Enlist your child’s help in making the grocery list. Let him/her help you find items on the shelf while shopping. Look at the name of items as you unpack and store away after grocery shopping. Playing: Empty cereal boxes and other cartons in a pretend supermarket provide another way for children to play and interact with words. Provide lots of blank paper with crayons or pencils so that children can draw and write. Like labels, informative charts or posters in the home can encourage children learn new words. These charts could be as simple as showing the alphabet to numerals or related a specific interest of you child such as vehicles, vegetables etc. calendars and maps are also items with text which you can post to a wall or bulletin board in your home. One of the first things you should post is your child’s name within clear view. Point to and read aloud the name everyday. Indicate the first letter that your child’s name begins with. Magnetic letters placed on the door of the refrigerator provides your child an opporunity to play with letters and form them into words. Note: All these tips can be applied to helping a child to learn to read and write Arabic or any language for that matter. What are some ways that you make your home a print-rich environment? Please share in the comments below. I’d love to hear from you. If you find the information above useful, you can share a link to it on Twitter and Facebook or even post a link to it on your blog. Shukran (Thank you) for your support and cooperation. I’ve been a member of the Islamic Writers’ Alliance (IWA) for about a year now and have found the support and resources of this group to be extremely valuable. The IWA networks members through its online group (or egroup). I’ve come into contact with many talented and hard-working Muslims from around the globe: poets, writers, publishers, editors, journalists, newcomers to writing and those who love just love reading. I’ve learnt more about the world of publishing and writing than I had ever known before. What’s more I’m happy to work with Muslims who value and advocate literacy in the Muslim community. That is why I want to tell you about the IWA’s campaign, Be a Muslim Champion, because it is an opportunity to support a unique Muslim organisation that is working toward a worthy goal. Grants book awards to Muslim schools. Conduct annual poetry and writing competitions. If your child is a student in an Islamic school, it’s possible he may have access to books in his/her school library through a school award given by the IWA. Maybe your teenage child or a friend or even you would like to enter a Muslim run writing/poetry competition, then you can with the IWA. Maybe you’ve read some of the Islamic stories or poems you liked in the IWA’s magazine and anthology. The IWA is a non-profit organisation based in the U.S. that would love to have your support. You can join the IWA and/or give a donation. – To find out more about the IWA or how to become a member visit the website. – To make a donation and for more information on how to Be a Muslim Champion visit here. Give your support to a Muslim non-profit organization that works to benefit our Muslim children and teens! Almost every other day somewhere in the world there are people talking about and actively seeking ways to promote literacy and encourage reading. Today I share with you some of the news and buzz taking place as well as some interesting sites and new books. Read more from the article “Is Writing Fiction Allowed? What’s Your Proof?” here. The Guardian (U.K) newspaper recently launched a book site dedicated to children’s literature. This site is for general kids lit but it is attractively designed and teeming with content on general fiction children’s literature. I really like the fact that children are the ones who are doing some of the interviews (you can read some or listen to some) as well as the reviews. YOu can search by age or type of books. Check out the site here. This publisher has produced some other high-quality picture-book type books for young readers such as “Time for Isha’a ” as well as “The Jolly Jamaat ” which I reviewed here. This video from Library Ireland Week showcases the smart library. Does your library look like this? Libraries are down-sizing and even closing all around the world, but especially in developed countries such as U.K. ans U.S. Yet this video shows the uniqueness of libraries and their users. A fun part was the books falling down, domino style. Recently, on a visit to the home of a new acquaintance, I took a gift of a book for her 7 month-old infant. It was a plastic-coated board book filled with bright pictures of animals. The pages were sturdy, with clear, bright colour pictures of animals. Before I could place the book within his reach, the baby, gurgling and dribbling, tugged the book out of my hand. He looked at the cover of the book and eagerly grabbed the edge of the first page that I began to turn for him. He looked at the pictures with big clear eyes. He sat there quiet, absorbed as he looked on; a smile on his face. It was then I heard my new friend say, “Books are new to my child.” Then she continued by saying, with a casual shrug, that children in her culture (I am not going to say which) prefer to play rather than read books. I was taken aback and greatly saddened when I heard her say this. Why? Babies and books go together. But here was a child at seven months old interacting with a book for the very first time. Books for babies, like toys for babies, are everywhere now. They’re made out of firm board; some with plastic or rubber coating. There are even books made out of cloth. Whichever kind, these books are made to withstand chewing, pulling, tugging and washing (to get them clean or to have child play with in bath). Parents can aim to buy one or a few of these kinds of books for babies from among all the toys that they purchase for their little one. I watched as the baby played with the book, all the while his eyes sparkling with delight as he looked at the bright animals on each page. I was curious as to know what was he thinking as he ‘turned’ the pages. What would happen if I began to read the words aloud; clearly and slowly. Oh I am sure then he and that book would have been the best of friends! Parents need to make the first step toward creating life-long readers. But here was a parent who readily acknowledged that books were not liked in her culture even from a young age, and from her reaction it seemed she didn’t find that this was a problem. 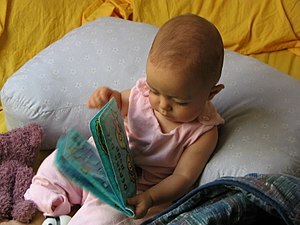 While it may be difficult to break out of certain cultural practices, research shows that making books available to children from the early years and reading to them, helps establish the foundations for developing into a good reader (and someone who will grow up to like reading as a form of entertainment). I knew that the little book will see rough days ahead; a corner chewed on here, a page ripped off there. But that is fine because I knew what was important was that this book presented to the baby a whole new way of seeing the world. It presented print and pictures. It was entertainment as much as his rattle. With the presence of more books around him, and in hearing them being read aloud to him; this child would grow up to find books not just useful but also satisfyingly entertaining. What’s more it’s likely he would develop into an early reader. If only his mother was ready to be the one to change the very thing she observed. Action Points: There are many benefits in providing books in the home for a child and in parents finding time to read to their child. What’s most important from an early age is to try to make books, and not just toys, available to your baby. Also, provide books with bright, clear pictures (whether with text or wordless). Spend a little time everyday ‘reading’ to your baby (this could be simply talking about what you see in the pictures). Finally, don’t forget to sing (chant) and talk to your child as much as possible. Do these simple steps and you will be laying the foundation for a child who grows into a life-long reader.